Frank’s Steak House has been a success for decades. What’s the secret? 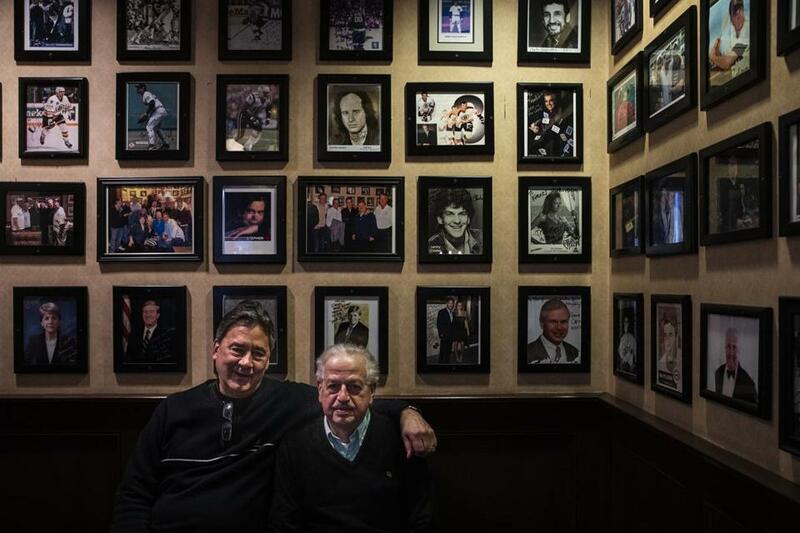 George Ravanis (left), owner of Frank’s Steak House, and restaurant manager Rocco Ciarlone. Frank’s Steak House. Been in North Cambridge forever — since 1938, to be exact. Owned by the Ravanis family since 1974. I’d cruised by for years, usually in pursuit of a new restaurant in Harvard Square. I filed it away as one of those landmarks I’d get to eventually, like the Hilltop Steakhouse or Durgin-Park. Except both of them are gone now. Which is why I found myself eating a cheeseburger at Frank’s on a frigid Thursday a couple of weeks ago, among the jolly early-bird crowd. As so many hallowed restaurants close around here, I felt as though I should pay my respects. Here was an old restaurant that stayed stubbornly, proudly in business — complete with a $15 prime rib, soup, vegetable, and dessert before 6 p.m. This isn’t to say that Frank’s is exclusively for diners of a certain age. I’d heard tales of Frank’s from my own peers, people who treated it as a movie set. One recounted a meal complete with a lounge singer. Another implored me to linger in the front entrance to ogle photos of bygone politicians on the wall. It was that kind of place. The co-owner, George Ravanis, should have been on a golf trip, but he got a bug. So instead he’s here in icy Cambridge sitting in a booth with me, in between intercepting phone calls from his golfing buddies, talking about cigars. He riffs on his customers. Elizabeth Warren was here a few weeks ago for steak. They joked around a bit. He’s trying to change a bit with the times, he says. He doesn’t want his restaurant to be seen exclusively as the type of place you’d take Granny for a nice relish tray or as a pit stop for visiting politicos. He’s modernized the dining room — instead of “old,” he prefers the term “retro.” There are sleek new lighting fixtures like you might see in a Restoration Hardware showroom. And the food is different, too. “We’d always been pretty good. We were solid. But then my chef of several decades passed away, and he had that old-school mentality with a lot of freezing. Now we’re doing things the right way — almost like a real restaurant,” he says, grinning. Now fish is delivered fresh multiple times per week, he says. His produce bill? Exploded. He’s tweaked the drinks list, too. This weekend, chef Mark Travassos will try new specials: Greek lasagna, Greek salad, roast stuffed pork loin with cinnamon apple stuffing. He’s added new items — some “pizzazz,” Ravanis says, like rigatoni Bolognese and beefsteak tomato and caprese salad. Shrimp scampi, a recipe from the old Fantasia’s restaurant on Concord Ave.
“I read. I go to seminars,” says Ravanis, who with his brother Bill Jr. took over the restaurant from their dad when he died in 2009. He watches what other restaurants are serving, too. He was in Southie recently with his kids for dinner. Everything was a la carte. “$34!” he explodes. “And they don’t blink an eye!” Most dishes at Frank’s are under $20 and come with sides. It should be noted that once upon a time, Frank’s was a pioneer. In the 1950s, a Chinese chef, Wee Leo, ran the kitchen. He mixed steakhouse standards with Chinese food and 99-cent lunch specials, cooked in a tiny kitchen. One of his specialties, the Sizzler, is still on the menu — a boneless New York strip sirloin served smoking in a cast-iron skillet. And it is exotic now, too, but in a different way. It’s unusual because it hasn’t changed too much — at least, in the ways that matter. “I see restaurants where servers are in jeans. I get that in Inman Square or Davis Square. But if you go to a steakhouse or an American grill, I don’t need jeans. I think it’s disrespectful, with too much of an air of casualness. I think it reflects their attitude, as opposed to a uniform, feeling like they’re part of something,” Ravanis says. Here, servers wear black Oxford shirts and black khaki pants. Cambridge’s Patti Epps has a 12-year-old son who eats at Frank’s every year on his birthday. A couple of years ago, it was decided that he was old enough to splurge on the two-foot-long Tomahawk steak. She’s been eating at Frank’s since she was his age. Sometimes they stop in after Little League for nachos and buffalo wings; sometimes she goes alone. “I’m a single mom, and the only place I go by myself is Frank’s. I’m comfortable here. I don’t have to worry. If someone comes up and starts talking to you who you don’t know, the staff watches out for you. It’s a comfort,” she says. My server is Jane Goodwin, who’s been there for 39 years. “They’re good to me. It was convenient. I had two kids, the hours worked, and one year went by, and then another,” she says, heading off to her regular tables. And so it goes at Frank’s, where at 4 p.m. a soul station blares Smokey Robinson and Marvin Gaye. Ravanis works the room and greets guests. Paul Clark is in from Salem having meatballs. He was just at a wake. “My parents used to eat here when they were courting. They’d be 105 now,” he says. His wife smiles. Mike Griffin from Quincy is eating fish and chips. He stops in every Thursday after his chess game around the corner at the Boylston Chess Club. And Charlie Keefe, who owns funeral homes in Arlington and Cambridge, holds court at a round table in the back, rhapsodizing about the scallops, which he says are better than the ones he gets on the Cape. He and his wife, Linda, eat here at least three times a week. He’s joking with Jane. “Don’t be fresh,” Linda chides him. Billy Joel couldn’t have sung it better. I sit back in my booth and watch as people come in from the cold in sludge-stained parkas. Dining room manager Rocco Ciarlone, a longtime staffer at the old Marino’s and Fantasia’s, squires each person to a seat with the dignity of a Cheshire cat. I ask Ravanis why he’s stayed in business for so long. “The biggest thing is, no matter where I go, you never see the owner or manager overseeing what’s happening. I’m standing there, scanning. I can see a nod, an inflection, in the customer’s face, and they get that service right away. It’s a business. The customer has to get the service,” he says. He thinks back to a dinner gone wrong a while ago, seven middle-aged guys whose food got messed up. The meal cost hundreds of dollars. Oh, and the food. I ate the $14 All-American burger while the oldies played — a towering sandwich with barbecue sauce, lettuce, tomato, cheddar, and onion rings, served on a silver tray surrounded by a pile of thick-cut fries. I asked for it medium, and it was medium. It was juicy. Let’s face it, though: At some restaurants, it’s not about the food. It’s about the atmosphere, the history, the service, the place in the community. But know this: It was also a very good burger.